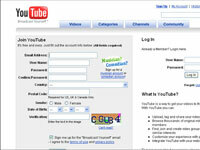 Creating a YouTube account is free, quick, and painless. 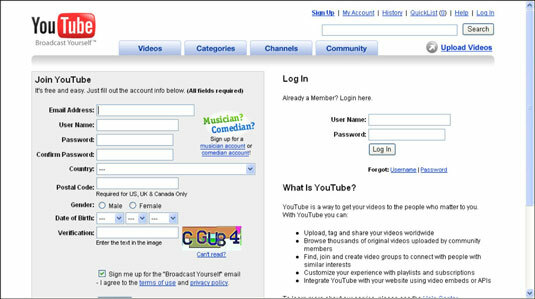 To create a YouTube account, just submit a few bits of basic information and create a username and password. That’s it — you don’t need to add your street address or phone number, and YouTube doesn’t ask you for a credit card number. 1Go to YouTube.com and click the Sign Up link. The Sign Up link is at the top-right of the page. This link takes you to the Create Your YouTube Account page. 2Enter your e-mail address and a password. You must enter a valid e-mail address to register. 3Fill in the Re-type Password and Username fields. It’s a good idea to jot down your username and password in case you forget it. 4In the Location drop-down list, select the country where you live. Check out the rest of the list . . . do you know where all those countries are located? This is required only for citizens of the United States, United Kingdom, and Canada. 6Click to select your gender and enter your date of birth. Why your date of birth? Because YouTube is very specific in its terms of service that it doesn’t consider itself to be a site that is appropriate for anybody under the age of 13, and it doesn’t allow anybody under that age to register an account. 7Type the characters (letters and numbers) from the colored box into the Word Verification field. YouTube wants to confirm that you’re an actual human being and not a computer program creating false registrations. If you can’t read the characters, click the New Image link next to the box to view a different image and color scheme. 8Check or uncheck the next box with the unwieldy name: Let others find my channel on YouTube if they have my email address. This gives you some control over who sees your videos. 10Click the Create My Account button. If you leave any fields empty or if you choose a username that’s taken already, YouTube refreshes the page with red warning notes identifying the fields that need to be corrected before you can register.